Today Facebook has launched a dedicated app for Samsung's Gear VR headset. It's called Facebook 360 and is already available through the Oculus app on Samsung handsets that are compatible with the Gear VR. 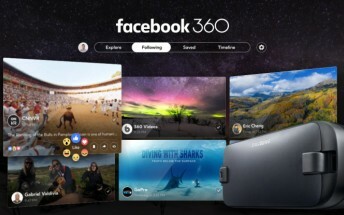 Facebook 360 has been created with the aim of making it easy for you to browse through the millions of 360-degree videos and photos that are posted to the social network, and experience them in the immersiveness of VR. There are more than 1 million such videos already up, and more than 25 million images. Facebook 360 shows you the 360-degree content posted by your friends and people and pages you follow, but you can also see the stuff you've saved and discover something new to enjoy whenever you feel like it. The Explore section will give you a selection of the most interesting 360-degree content. You can also see your own uploads (if you have any) through the Timeline section. The app even lets you react to the content you get.